Successful product design and manufacturing requires the consideration of several perspectives including mechanical engineering, electrical engineering, materials engineering, manufacturing, sourcing, and supplier quality. This article discusses the materials engineering perspective for product design and manufacturing. It is an abbreviated version of the first lesson in a free, 3-lesson series that teaches materials science and engineering as it applies to product design and manufacturing. 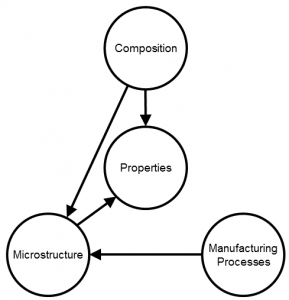 Materials science is concerned with understanding the relationship between a material’s composition, microstructure, and properties and the effects of manufacturing processes and composition on a material’s microstructure. Materials engineering involves applying materials science knowledge to the engineering of products and manufacturing processes. Materials that degrade too fast, resulting in premature product failure. Components that cost too much. Difficult to fabricate components and joints. Many of these problems can be avoided by applying the materials engineering perspective to product design and manufacturing decisions. Two pieces of metal with the composition and microstructure necessary for the blades to have good corrosion resistance, high hardness to maintain the cutting edge, and good toughness so as not to fracture when dropped on concrete. Plastic with the composition and microstructure necessary for the handles to be rigid enough to transfer a user’s force to the blades, and with enough strength and toughness so that they do not crack or break when the scissors are dropped onto a hard surface. 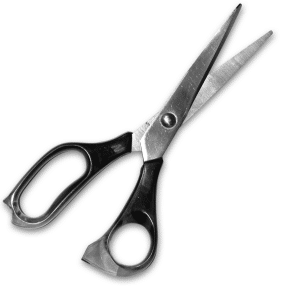 Furthermore, people will not buy the scissors or it will cost too much to manufacture if the blade or handle materials do not meet these requirements. The same concept applies to any product. 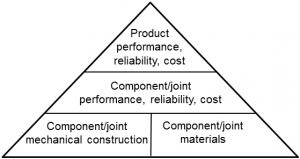 Product performance, reliability, and cost depends on component and joint performance, reliability, and cost, which depends on component and joint mechanical construction and the materials used for a component or joint. Mechanical construction refers to the shape, dimensions, and features of a component or joint. Selecting materials that satisfy component and joint performance, reliability, and cost requirements. Implementing control measures that ensure the properties of materials that make up components and joints consistently meet specifications. Whether a product meets all its performance, reliability, and cost requirements depends on whether a design team selects the appropriate materials. The process of selecting materials is discussed in the Materials Selection lesson of the series. Writing thorough design and process specifications that list all pertinent materials requirements such as composition, microstructure, and properties. A robust process for selecting suppliers capable of consistently providing materials that meet requirements for composition, microstructure, and properties. Using capable manufacturing and assembly processes. 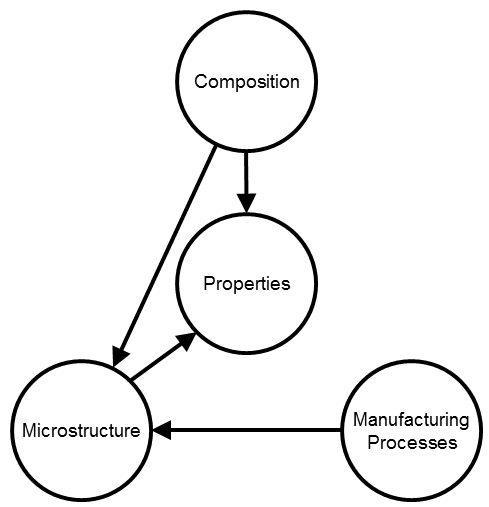 In conclusion, including the materials engineering perspective as part of product design and manufacturing enables selection of materials that have been optimized to meet performance, reliability, and cost requirements and control over the variation of the composition, microstructure, and properties of the materials so that they consistently meet their specifications. When both of these happen, the likelihood of product success is greatly improved.